Until the mid nineteenth century, psychology has been a part of philosophy. The change came when three books were published almost simultaneously. Darwin argued the essential continuity of man and other animals in “Origin of Pecies”, making human mind to be experimented as it is for animals. Fechner authored “Die Psychophysik”, which provided a detailed, theoretical explanation of the relation between changes in specifiable physical events and verbalizable psychic responses. The third book was “Reflexes of the Brain” by Sechenov who had advanced out understanding of simple sensory-motor reflexes by using techniques that isolated nerve-muscle preparations from the living organism. Once psychology became independent academic fields, people encountered key questions such as “what are the relationships between animal and human behavior, environmental and mental events, and physiological and psychological process?” One school, founded by Wilhelm Wundt in 1880, described the contents of human consciousness into their relation to external stimulation. However, Wundt ruled out such sensations as feelings of awareness or perception of relations as elements of consciousness. He concluded that human’s complex mental functions are out of the scope of psychology. Only after WWI, scholars began to analyze human-specific higher process, e.g. thought, language, and volitional behavior, and Lev Vygotsky was the one who constructed a theory of human psychological process, arguing that the higher psychological process of human beings is due to a multiplication and complication of principles derived from animal psychology. That means, it is not the principles of psychological process that bring about difference between human and animal thought process, but the socio-economic reasons that make human thought process more sophisticated and complex than those of animals. Vygotsky thought that like tool systems of Marx and Engels, sign sytems (language, writing, number systems) are created by societies over the course of human history and change with the form of society and the level of its cultural development. He believed that the internalization of culturally produced sign systems brings about behavioral transformations and forms the bridge between early and later forms of individual development. In the book “Mind in Society”, he analyzed psychological development process of children. Through the comparison between human children and animals, he claimed that what distinguishes human from animals is the sign-system. Thanks to the sign system, even a small child is able to plan and execute the complex procedures. Signs are the artificial and self-generated stimuli. For instance, when we are in a hot room, not only we feel the heat (original stimulus), but also we understand the situation using a word “hot”(sign). Thanks to language, human beings extend the operation of memory beyond the biological dimensions. 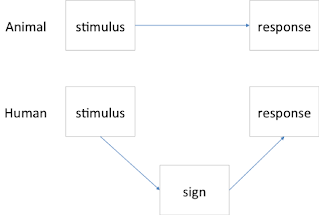 Sign system is the complex thought system inside the human mind, developed by tool and speech. 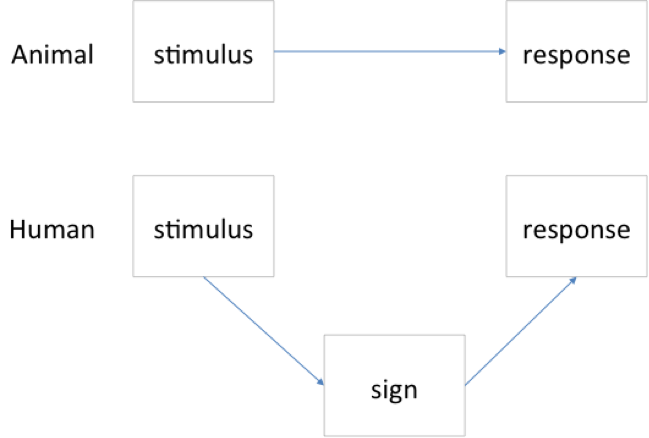 By using the sign system, human beings can perceive the “real objects”, i.e. “human beings do not see the world simply in color and shape but also as a world with sense and meaning” (page 33). Tool use is also human specific behavior. Tool and speech are together essential human natures, but they are different in their functions. Tools work as the conductors of human action, and it is externally oriented and is used to master the nature. Instead, sign system works to regulate human internal minds, and it is internally oriented and is used to master one’s own behavior. Originally, the book aims to improve the child education. Using the arguments I introduced above, he placed importance on understanding children’s zone of proximal development. Zone of proximal development is “the distance between the actual developmental level as determined by independent problem solving and the level of potential development as determined through problem solving under adult guidance or in collaboration with more capable peers (page 86)”. When children face “tasks in the zone”, they need the assistance from teachers, and in the future the tasks will be out of the zone, i.e. children will be able to do it by themselves. That exactly is the psychological development. Through the assistance, children can imitate what their teachers & adults do, and that imitation go beyond the limits of children’s own capability. Once children experience it through imitation, they will be able to “internalize” the process, and then to reproduce the action by themselves in the future. That is why Vygotsky emphasized that the children’s psychological development (internalization) often comes after the learning. As a practical implication, we can say that it is crucial to understand whether students need your assistance now. He also emphasized the importance of play in children’s development. As now we understand, play (e.g. playing house) helps the development process for the tasks in the zone of proximal development. Through the play, or imitating adult’s behaviors, children will be what they cannot do independently now, and eventually they master what they cannot do before (internalization). It is a impressive book. Although Marx and Engels provided general model of relationship between material conditions and upper structure, as far as I know they did not provided the model to describe human psychological development. Vygotsky illuminated the development process of human mind, which is purely a historical product. The model he provided is still the foundation of developmental psychology. Another thing I feel curious is that how our mind will be in 21st century. We now live in the unprecedented age, which will mark the ICT revolution, the third revolution after the agricultural and industrial revolution. Today, people are far more connected than before, and that will bring us about the significant psychological development. Under the circumstances, what will be the main subjects or problems of human mind? To imagine the answer to the question is exciting.